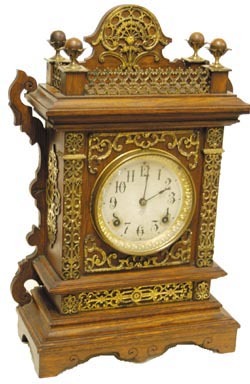 Ansonia Clock Co. mantle clock, "Cabinet F", 1894. This was the last model in the series of 6 clocks, each made of Antique Oak with Brass Trimmings. The front is almost completely covered with brass trimmings and glory be I think it is all there, original, and never cleaned or polished. Same with the case. I\'ll retract just a little. One of the 4 balls on top has been replaced. Good work but nonetheless replaced. This clock has an original paper dial, gilt metal sash and bezel. Glass is convex. All of the series have 8 day striking movements. Strikes a standing cathedral gong. Signed dial and movement, correct pendulum. Oak case is 19" high, 12" wide. Ly-Ansonia #851.